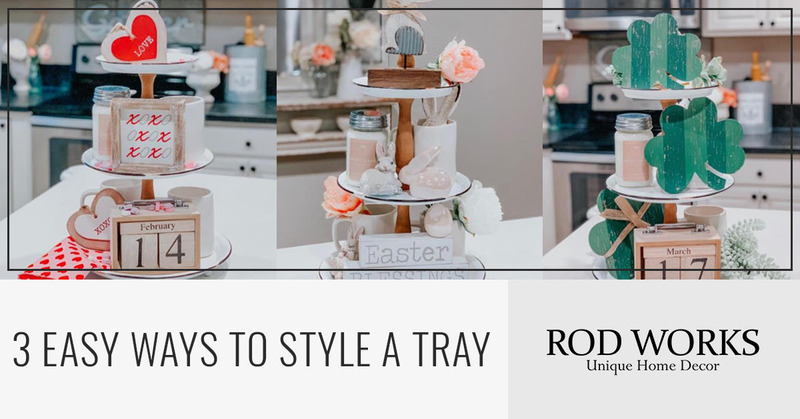 Today Rod Works is going to show you how to easily style a three-tiered tray. It can take you from an everyday look to three seasonal looks simply by adding a few cute holiday items. Step 1. Pick your tray. Here at Rod Works, our home store has a beautiful selection of tiered trays. This white enamel tray is one of our favorites and is so versatile! Step 2. Add your everyday items. The items we chose were a couple of coffee mugs and a great smelling candle. Another item you can leave up every day is a perpetual calendar. You can change the date every day or set it to the next holiday’s date. Add a few touches of greenery or flowers for an everyday look that goes with any season. For our Valentine’s Day look. We kept our everyday items on the tray. 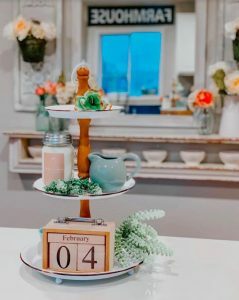 The mugs, calendar, and candle, but we removed the greenery. Changed the date on our calendar to the date of the next holiday February 14. 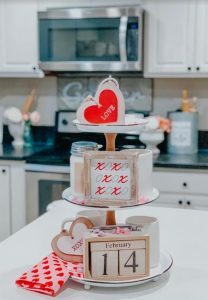 Added a heart dish towel, and three Valentine specific small signs. One sign on each tier. To give it a little extra flare, we added a few Valentines candies sprinkled on the tray. Next up is St. Patrick’s Day. We removed any Valentine’s specific items, but kept our everyday items, and added back in our greens. We changed our date to March 17 on the perpetual calendar. We used our pack of three wooden shamrocks. 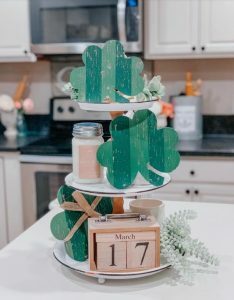 They were the perfect size to add one shamrock to each tier. We removed everything but our mugs and candles. 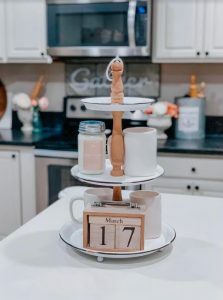 We replaced the perpetual calendar on the bottom tier with an easter sign of the same size. 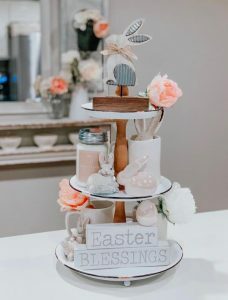 We used our wood and metal bunny on the top tier of the tray. We added more ceramic bunnies and eggs to each tier of the tray. For an extra playful look, we have some bunny ears peeking out of the mug. It looked perfect just like this, and you could stop at this step. But we wanted an extra spring feel, so we added a few pink and white flowers. Changing out a few small items on your tray each month is a very inexpensive way to create a beautiful holiday centerpiece. Shop at Rod Works today for quality decor pieces that can be used throughout your home. Our home store is passionate about helping you find pieces you love!